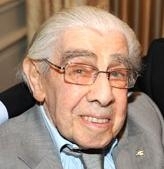 Companion Willie was the Order's Honorary Solicitor for over fifty years. He began his career in partnership with David Naply (later to become Sir David). William Foux was for many years the solicitor for the Metropolitan Police Federation. He also supported many charitable organisations particularly JAMI the mental health charity. Happily he retained all of his faculties until the end of his life.